Has maintained $0.05-per-share quarterly payout since 2009. Like a beam made of tempered steel, United States Steel (NYSE:X) will pay its regular quarterly dividend of $0.05 per share on June 10 to the holders of record at the close of business on May 14. That's the same regular payment the steelmaker has made every quarter since 2009 when it slashed its payout from $0.30 per share. Pittsburgh-based U.S. Steel, which has been making steel for more than 110 years, has annual raw steelmaking capabilities of 29.3 million net tons. It generated more than $19.3 million in revenues in 2012. 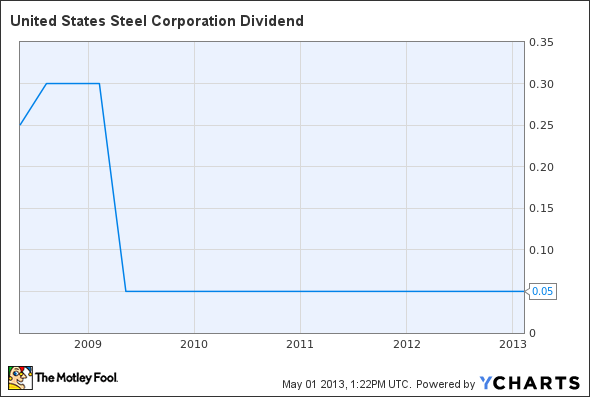 The most recent dividend payment equates to a $0.20-per-share annual dividend yielding 1.2% based on the closing price of United States Steel's stock on April 30. X Dividend data by YCharts.